Here's a Korean dish that you will definitely find delicious and will keep on making for your family. The secret? The beef was marinated in Knorr Beef Cubes! 1 This recipe may take some effort but we promise you that it will be worth it! There are 3 steps in preparing Bibimbap. First, you need to make a marinade. Next, prepare the sauce and lastly, prepare the topping. 2 Let's begin by combining all the marinade ingredients, including the beef, in a bowl. Blend them well and store in the chiller to flavor the meat. 3 Next, combine all the sauce ingredients and mix well. Set aside in the chiller. 4 Lastly, prepare the toppings by sauteeing each ingredient with a little oil. Season with some salt and pepper then set aside. 5 Now, get a skillet and make it nice and hot over medium heat. Throw in the beef and cook until meat is slightly brown. 6 Prepare a nice big bowl and arrange the Bibimbap over. Start by scooping out rice and placing it at the center of the bowl. Top the rice with the cooked beef and the sauteed vegetables. Pour the sauce over and that's it! Our dish is done! 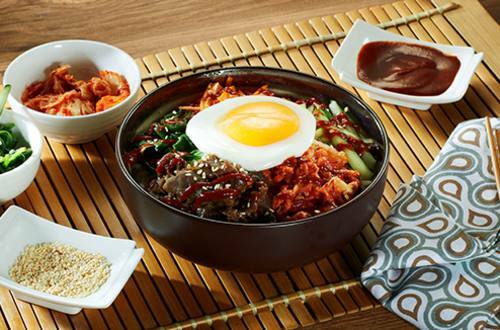 Impress your guests or loved ones when you serve Bibimbap at home. The taste is as lovely as it looks!